We don't usually wave flags for causes, but our sister upcountry, the CBC, is going down the road to, let's be clear about this, junk music -- middle-of-the-road pop, lazy commentary, and lack of any intellectual spine. There's a lot being said about it, but you can read about it here and join the (as of today) more than 600 signatures on the petition. Here in the US, we've managed to destroy public broadcasting. The CBC thinks that's a good model. If you're a Canadian listener to K&D or N&K, or just an interested party who's loved the CBC's strong programming, now is the time to make a statement. If you're not listening our successor show, Noizepunk & Das Krooner, you're missing out! Lots of new guests, fun, and fast-paced unKalvosian dialog! Gene Pritsker and Charles Coleman host the show. You'll be able to listen right here -- no, not live but good as it gets from their studios in Manhattan, exclusive right here! Ready, set... listen to Shows #1-4! Komposer Kombat! Listen to the results of the kompetition, read about how it happened, and listen to the whole show (#537) in its entirety! More than 40 new pieces were created for this event, and premiered in preliminary rounds and the finals were broadcast on the show from Studio Z. Yee-hah! We talked with the performers -- Amanda Baker, Carla Parodi, Lydia Busler-Blais, Lucy Yates and Lisa Jablow -- and other composers -- Rob Voisey and MJ Leach among them -- and had a rollicking time to end our run on the air! But that's not all! There was also Anti-Social Music! A group we can hardly describe -- funny and personable and brilliant musicians playing live in Studio Z. There's never been so much laughter on K&D combined with so much diverse music. Listen to Show #536. Oh, you thought it was over, did you? Here's Noizepunk & Krooner Join Gene Pritsker and Charles Coleman for the first successor show to K&D. You'll be able to listen right here -- no, not live but good as it gets from their studios in Manhattan, exclusive right here! Ready, set... listen to Show #1! We're getting ready the past two shows, plus all of Komposer Kombat! If you can't wait to read something, then first point yourself here on the bulletin board and then here to read the K2 descriptive essay. Back to you all soon! We had a fantastic day on Saturday! We had lunch with Pamela Zero, who then did an amazing show with us, including a live performance of four pieces. She'd just gotten back from Russia, and skipped from two days at home straight to K&D. What an honor! Be sure to listen to Show #534. Next week: Anti-Social Band! They're actually Anti-Social Music, but we have a group called "Social Band" in Vermont, and this hot group from New York is opposite in every way you can imagine! Coming up September 10! Other upcoming shows here ... just two more, including Komposer Kombat! Be there! Our good friend & composer P. Kellach Waddle couldn't make it up from Texas, so... ...we talked to each other -- but not before playing the winners of this years Jeu de Temps / Time Play competition! With the help of jef chippewa, we were able to broadcast all five of them! Listen to Canadian electroacoustics from new & emerging composers as well as Kalvos and Damian in their real composer guises as Dennis Báthory-Kitsz and David Gunn! Show #534. Next week: Pamela Zero! Just off a Russian tour and with hardly a stop back home, she'll be coming to K&D's famous Studio Z to talk and perform her amazing vocla works! Coming up September 3! Other upcoming shows here ... just threeleft! We're so happy these two very different composers came back to visit! Our good friend Peggy Madden doesn't live far away, and has come back for her fourth K&D show, with new acoustic and electonic compositions. And hear a special comparison of Midi demos with their final results! Show #532. And just a few days ago, Linda Catlin Smith visited from Toronto, bringing new music and her special sound of subtlety and music that Dennis Darrah says "suspends the grasping of memory." Listen to this amazing sound. Show #533. Next week: JTTP, and us! We'll be broadcasting the winners of the Canadian young electroacoustic composers competition, and interviewing each other. How could that be? Coming up August 27! Other upcoming shows here ... just four left! The Kidwell-Shatin-Pritsker-Coleman-Zummo-Perez Connection! Well, connected by weeks, anyway. David Kidwell came into the studios from the banana belt, where Vermont joins Massachusetts, and played his music, talked about conducting, and generally revealed the state of civic music-making. Wonder what that means? Then listen to Show #528. The following week, Judith Shatin arrived at K&D, replete with stories about her compositional diversity, as well as what secret past she shares with, of all people, Kalvos! Intrigued? Yup... Show #529. As if we didn't have enough trouble, Charles Coleman and Gene Pritsker appeared for Show #530. For more about that, see the next announcement. And just this past Saturday, Peter Zummo and Yvette Perez, half of "Birdbrain", gave a fantastic live performance in Studio Z, and with the dryest of humor, made K&D a fun place after all. You bet! Show #531. The latest playlists are up as well as Damian's essays: "Dada Vinci," "Punjab Patel," "Thumb Music," and "The LAnd of Satan's Dancing Cows." Whatever did we mean about Charles Coleman and Gene Pritsker? We mean what we mean: That Kalvos & Damian may live on in the broadcast world as Noizepunk & Crooner, alter-egos of Charles and Gene. Click right on this here link to find out more, and stay tuned to see what happens! Next week: Peggy Madden Returning for her final K&D appearance, Peggy is bring new music of her own, and favorites she's cooked up for the day! Coming up August 13! Barry Schrader made the trip from CalArts to KalDam! The interview was good-humored, insightful, and too short from the man who shows what avoiding concrète can make possible. Listen to the possibilities and the fun in Show #527! The latest playlists are up as well as Damian's essay about the Inharmonic Convergence. Next week: David Kidwell The Vermont/Massachusetts composer and conductor joins K&D live in the studio, where he'll dish the dirt of making a musical career in the rural north country. Coming up July 16! Vermont Composers and Pamela Z! A double helping of new shows is posted! The Vermont Composers Festival was the subject of our laid-back Show #525, where some uninterrupted music by the show hosts can also be heard for a change. And then there was the non-laid-back manic interview with Pamela Z from, um, Studio Z (just not ours). We had great fun, and got to listen to wonderful stuff -- and so can you. Show #526. The latest playlists are up as well as Damian's essays about band battles and Bumpkinses. Next week: Barry Schrader He's coming all the way from beautiful downtown Kolly Fawnia to K&D and will bring his amazing new electroacoustic work. July 9 is not to be missed! Okay, it's official! Komposer Kombat is September 16-17 For our last broadcast show, Kalvos & Damian will present a Survivor-style event, Komposer Kombat. Over two days, composers will be tossed parameters for composition, and join us live and online for performances, judging, subversion, subterfuge, humor, and madness. Want to participate? We need composers, performers, and judges. So let us know! Are we planning to podcast? No, we're not. We've mentioned the legal limitations on our show archives before -- dialup speeds and monaural streams. Though we have all the shows archived on the hard drive, the insane rights issues make it impossible for us to use them except for research. The Grain of Your Brain ... Whoa! He said "the grain of your brain" and that was it. I wrote down what Allen Shawn said, because it was all just so good. Allen had more to say and more to play than we could take in, but you're better than we are, so listen to Show #524. The latest playlists are up as well as Damian's essay about exactly what Mother Nature abhors. Next week is the Vermont Composers Festival for the first time in eight years. We'll feature music by composers from Vermont. Hey, we're good up here! Almost Over! Yup, just 12 broadcast shows to go, and we're outta here!. And just as a taste of the upcoming, we'll tell you that our last show will be Komposer Kombat, the K&D take on a composer "Survivor"-style program ... two days of competition with on-the-spot composing, judges, subterfuge, and madness! Look for the official announcement in early July! In the meantime, if you're a K&D guest composer, be ready to join in for the final show Komposer Kombat on September 16 and 17! Time to Review! What shows do you want to hear? Rob Voisey 60x60'd us right up to 120x100! The 60x60 project was featured on the latest K&D show, with Rob Voisey joining us in studio with Anne Fiero, all trying to play as many of the 60x60 project pieces as possible. With nearly 900 to choose from K&D managed to squeeze in 100 sound bits in two hours. If you don't know what 60x60 is, listen to the show (Show #523). Our Time-Warp Place-Warp interview with sylvi macCormac was June 4. sylvi macCormac joined us via a temporal/geographical interview ménage with her electroacoustic work and commentary. Listen to sylvi -- always a presence online, but whose voice is a privilege to hear. (Show #522). Reena Esmail joined us in the studio with a rapid-fire hour of verbal and musical articulation that had both Kalvos and Damian speechless from time to time. Hear Reena take the controls on May 28th (Show #521). The previous week for our 10th Anniversary K&D Show, Brian Johnson talked and performed his own work, plus music by Cage and Lucier. And if you wonder what the show's title means ("What's That Sound? "), you just better get read for ear-splittingness (Show #520). Eric Lyon stood us up. We were devastated because he's one of our favorite composers with new weird stuff always, but it's spring and he's just as spacey as the rest of us. So we kept our chin up and had a funny and intense show of newly received recordings instead! Have a listen to new stuff from K&D guests Neil Rolnick, Reena Esmail, Barry Schrader, Howard Jonathan Fredrics, and Ricardo dal Farra, along with others (Show #519). James Drew appeared via delayed interview, and told about his life and music. It was a pleasure to welcome James at last (Show #514). Following a winter recovering from a house fire that wiped out his artistic history, John Levin came by with new performances and tales of how one copes. We love John, our 'low maintenance' composer who's always prepared, personable, and funny! (Show #515). While Kalvos was away, Damian ran alone with the wolfish Troy Peters, returning to the show after a decade's absence, since he became conductor of the Vermont Youth Orchestra and an entrepreneur of sorts! (Show #516). And speaking of returns, our first guest (other than ourselves) on K&D was Thomas L. "Larry" Read, who came back after 10 years with stories of orchestras, performances, and irony of all sorts. T.L. has been a champion of new music as composer, violinist, conductor, teacher, and writer, and tells all! (Show #517). And finally, just yesterday, a guest cancellation gave us the pleasure of interviewing Jenny Lin, who was in the area performing. She gave us some live treats in this Dartmouth "Studio D" event, and exposed her artistically itinerant life (Show #518). Matthew Fields joined us to talk about the music and the story and the production background (not to mention the jokes) behind The Sages of Chelm. It was a pleasure to welcome Dr. Matt back to the show and hear how his musical life has changed in the past five years -- listen to it for the Whole Chelm (Show #512). And yes 510). Rami Bar-Niv Tore Up the Studio! He and Michael Hakim joined us live for intense piano & cello performances of Rami's music, as well as some conversation that kept both Kalvos's and Damian's wits tangled. Listen to it! (Show #509). He was here! He was! Baruch Skeer was in the studio, singing and talking and playing his recordings. Get to it! (Show #508). Please Retire the Debt! We offer our heartfelt thanks to all our contributors for 2004 for their generous gifts to K&D. But we finished 2004 in the red by $1,361, and contributions for 2005 have hovered near zero. Your contribution is strongly encouraged because we could sure use some help here. We know the economy's not so good, but there's any number of ways you can send us a bit of cash. The server, domains, etc. (before a lick of work is done) cost $1,536 per year. We use supplies, put up & feed guests, fix equipment and update software. If every site visitor contributed ten cents upon each day's visit, it would pay the bills. Try the PayPal link, or contact us via email or snail mail. Please. K&D gets 50,000+ hits per day (about 700 unique visitors). Help. Kalvos & Damian has won WGDR's "Excellence in Broadcasting" Award! Doggone! How can that be? 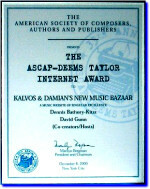 It says: The 'Best in Show' Award for Excellence in Broadcasting is hereby decreed to David Gunn and Dennis Bathory-Kitsz on this, the 16th Day of December 2004, in recognition of "Kalvos and Damian's New Music Bazaar" as an Exemplary Program on WGDR. That's community radio! Wow! Read Kalvos's comments. It's time for the annual Listener Response Awards! What do you think? What was the best stuff you heard on K&D? Let us know who should be this year's winner, and they will get a nice certificate and another play on K&D. Our newsfeed is running! Grab it! The newsfeed will provide the latest homepage, playlist, and upcoming guest list as soon as it's posted. Click this XML logo or copy this link (http://kalvos.org/kalvos.rss) into your newsfeed reader. Never Heard a Besto? David Gunn a/k/a Damian (or is it Kalvos?) created a Best of the Bazaar for each block of five shows through last year. No, this isn't just a selection or two that he likes. These Bestos are collages of sound art of the highest order! Eat your heart out electroacoustic composers!. More than seven hours of Bestos can be heard and #82 is the latest of these! IDs? You want IDs? We got 'em! We've extracted the funny IDs made for our show by Beata Moon, Christine Baczewska, Thomas Buckner, Jason Eckardt, Charles Coleman, Gary DiBenedetto, Judy Dunaway, Peter Flint, Bruce Gremo, Mark Gustavson, Scott Johnson, Joan LaBarbara, Dennis Darrah, Mary Lou Newmark, Phil Kline, Eve Beglarian, and Elliott Schwartz. Oh, they're not any big deal, but we like 'em, and they show another side of our guest composers. September 11 Musical Gallery is one of our most listened-to features, especially during this month. The New York Times article, "Elegies and Tone Poems Respond to Tragedy," appeared on October 29, 2001. Read Matthew Mirapaul's thoughtful piece about this collection on K&D, and listen to these compositions. Submitting music to K&D? Use our release form. We're still receiving recordings for broadcast that don't include this release, and that is (in this current climate) a, um, problem. Also note our postal address has been different for about three years, so if you're still using the old Box 2770 address -- please don't! Did you know that Frog Peak Music has scores and recordings by K&D guests? Now you do. Give them a visit. Oh, and Dennis/Kalvos and David/Damian are published by Westleaf Edition, and would sure appreciate it if you would visit to Westleaf and download & perform a score or two or three or more! WGDR's live stream uses Ogg Vorbis. K&D's present links to the live cybercast all launch a RealAudio stream based on WGDR's previous use of Real and MP3. Real doesn't support Oggs. So until we fix all those doggone links, please go to WGDR.org and pick up the stream directly -- and if you're using a 'classic' MP3 player, get the Ogg Vorbis plugin. If your local radio station would like to broadcast K&D, we'll be happy to supply the show on a pair of CDs at a nominal cost. Please contact us for information. A Record of Sheer Madness! Rob Voisey 60x60'd us right up to 120x100! The 60x60 project was featured on the latest K&D show, with Rob Voisey joining us in studio with Anne Fiero, all trying to play as many of the 60x60 project pieces as possible. With nearly 900 to choose from K&D managed to squeeze in 100 sound bits in two hours. If you don't know what 60x60 is, listen to Show #523. The latest playlists are up as well as Damian's philosphical essay on Coiffurniture. For the first time from Vermont's Banana Belt, Allen Shawn visits next week! We have no idea what Allen will put us through. Expect cracklingly dry humor and K&D to peel off in scales. Don't miss it! Our Time-Warp Place-Warp interview with sylvi macCormac is up! sylvi macCormac joined us via a temporal/geographical interview ménage with her electroacoustic work and commentary. Listen to sylvi -- always a presence online, but whose voice is a privilege to hear -- in Show #522. The latest playlists are up as well as Damian's essay on Harpy Marks. Rob Voisey Returns Next Week! This is a call-in, email-in program dedicated to the 60x60 project -- sixty 60-second pieces by 60 composers! Don't miss it! Yes, they've actually been here, but Kalvos didn't update this homepage. Reena Esmail joined us in the studio with a rapid-fire hour of verbal and musical articulation that had both Kalvos and Damian speechless from time to time. Hear Reena take the controls in Show #521. The previous week for our 10th Anniversary K&D Show, Brian Johnson talked and performed his own work, plus music by Cage and Lucier. And if you wonder what the show's title means ("What's That Sound? "), you just better get read for ear-splitting Show #520. The latest playlists are up as well as Damian's essays on both Boomwhackers and Black Bart. Ouch! sylvi macCormac Next Week! In a special radio art appearance from some 3,000 miles away, sylvi macCormac, composer and activist, takes on music, disability, and electroacoustics! Don't miss it! Almost Over! Yup, just 15 broadcast shows to go, and we're outta here!. And just as a taste of the upcoming, we'll tell you that our last show will be Komposer Kombat, the K&D take on a composer "Survivor"-style program ... two days of competition with on-the-spot composing, judges, subterfuge, and madness! Look for the official announcement in early July! In the meantime, if you're a K&D guest composer, be ready to join in for the final show Komposer Kombat on September 16 and 17! That's the name of our latest show because Eric Lyon stood us up. We were devastated because he's one of our favorite composers with new weird stuff always, but it's spring and he's just as spacey as the rest of us. So we kept our chin up and had a funny and intense show of newly received recordings instead! Have a listen to new stuff from K&D guests Neil Rolnick, Reena Esmail, Barry Schrader, Howard Jonathan Fredrics, and Ricardo dal Farra, along with others (Show #519). The latest playlists are up as well as Damian's essays that describes the world's loudest symphony by Claude Bruyant-Homme. Brian Johnson Next Week! Will he play or won't he? Join us for a live appearance by Brian Johnson, composer and percussionist and performance space director! Many hats, many drumsticks! Or at least you can hear shows because Kalvos is back working on this website. We have shows with James Drew, John Levin, Troy Peters, Thomas L. Read, and Jenny Lin! James Drew appeared via delayed interview, and told about his life and music. It was a pleasure to welcome James at last (Show #514). Following a winter recovering from a house fire that wiped out his artistic history, John Levin came by with new performances and tales of how one copes. We love John, our 'low maintenance' composer who's always prepared, personable, and funny! (Show #515). While Kalvos was away, Damian ran alone with the wolfish Troy Peters, returning to the show after a decade's absence, since he became conductor of the Vermont Youth Orchestra and an entrepreneur of sorts! (Show #516). And speaking of returns, our first guest (other than ourselves) on K&D was Thomas L. "Larry" Read, who came back after 10 years with stories of orchestras, performances, and irony of all sorts. T.L. has been a champion of new music as composer, violinist, conductor, teacher, and writer, and tells all! (Show #517). And finally, just yesterday, a guest cancellation gave us the pleasure of interviewing Jenny Lin, who was in the area performing. She gave us some live treats in this Dartmouth "Studio D" event, and exposed her artistically itinerant life (Show #518). Finally, the latest playlists are up as well as Damian's essays that go far afield outside life's diamond. Eric Lyon Next Week! Join us for a live appearance by Eric Lyon, doing his best to be personable with the relentless Kalvos and Damian! Two shows: Matthew Fields with Chelm and The Fire Organ! Last week, Matthew Fields joined us to talk about the music and the story and the production background (not to mention the jokes) behind The Sages of Chelm. It was a pleasure to welcome Dr. Matt back to the show and hear how his musical life has changed in the past five years -- listen to it for the Whole Chelm (Show #512). And yesterday, four musicians graced the Kalvos & Damian official loading dock to perform music with Fire Organ, including talking with Nora Jacobson about her film "Nothing Like Dreaming", and with Antoinette Jacobson, Larry Polansky, and Dennis Darrah. It was a wild ride! (Show #513). Listen to them both! And the latest playlist is up as well as Damian's essay on Prometheus and his fire organ of a different kind. James Drew Next Week! Join us for a radio art appearance by James Drew, working his way east from Utah, though not quite in time to appear corporeally on the show! Wayne Horvitz Makes It Big! Wayne Horvitz joined K&D to talk about his foray into the large form. Hear Wayne own up to the difficulties and the pleasures of working with large ensembles and mixing improvisation and notation. Listen to it! Show #511. And the latest playlist is up as well as Damian's essay on with his story continued ... with birds added to fish recipe. Matthew Fields Next Week! Join in for Dr. Matt, live in the studio with his new recording of The Sages of Chelm as he dishes the dirt on getting a major symphonic work recorded in the era of looking backwards. David Mooney Sent his Electrons! In a special radio art appearance, David Mooney created clips, mixes, and mutations! Hear Kalvos crunched, Damian defiled, works woven, and audio mooning everywhere! No food, but what the heck! Ya gotta hear it! Listen to it! Show #510. And the latest playlist is up as well as Damian's essay on with his story continued ... with added fish. Wayne Horvitz Next Week! Join in for Wayne Horvitz, recorded two weeks ago, just before the East Coast premiere of his Joe Hill. Hear how a composer walks the territory from pop to nonpop, improv to notation. Rami Bar-Niv Tore Up the Studio! He and Michael Hakim joined us live for intense piano & cello performances of Rami's music, as well as some conversation that kept both Kalvos's and Damian's wits tangled. Listen to it! Show #509. And the latest playlist is up as well as Damian's essay on, um, Tai Chi (so to speak). David Mooney Next Week! Join in for David Mooney and his self-portrait as radio art. It'll rock your ears! Our upcoming guest list includes Wayne Horvitz, Thomas L. Read, Hsiu-Hsiu Chang live in performance, Brian Johnson, Rob Voisey with 60x60, Allen E. Shawn, Troy Peters, Pamela Z, Barry Schrader, David Kidwell, Judith Shatin, Gene Pritsker and Charles Coleman, Peggy Madden, Linda Catlin Smith, Pamela Zero, The Anti-Social Band, Matthew Fields, Yvette Perez, and Peter Zummo. He was here! He was! Baruch Skeer was in the studio, singing and talking and playing his recordings. Get to it! Show #508. And the latest playlist and Damian's mysterious essay (don't ask). You must check out our upcoming guests! As soon as we said we were going off the air in September, the schedule crowded right up! So check out the guest list to learn when you'll hear from Wayne Horvitz or Rami Bar-Niv live in performance with Michael Hakim, or Thomas L. Read or Hsiu-Hsiu Chang live in performance or Brian Johnson or Rob Voisey with 60x60 or Allen E. Shawn or Troy Peters or Pamela Z or Barry Schrader or David Kidwell or Judith Shatin or Gene Pritsker and Charles Coleman or Peggy Madden or Linda Catlin Smith or Pamela Zero live in performance! And we have yet to schedule exact dates for The Anti-Social Band, Jody Diamond, James Drew, Matthew Fields, Carson Kievman, sylvi macCormac, William Mayer, David Mooney, James J. Pellerite, Yvette Perez, Larry Polansky, Kile Smith, P. Kellach Waddle and Peter Zummo. Phew! Recent Past Shows: Brian Sacawa and Wenli Zhou (#507) play music by Lee Hyla, Chris Theofanidis, Martin Bresnick, Philip Glass, Charles Wuorinen and Michael Gordeon played by Brian's amazing saxophone and Wenli's string-bustin piano -- live from Studio Z! ... Gregory Mertl (#506) as played by Anna Hendrickson, oboe; Courtney Orlando, violin; John Richards, viola; Florent Renard-Payen, cello; Kirsten Sollek, mezzo; Elisabeth Stimpert, clarinet; and Solungga Liu, piano -- live from Studio Z! Then there is Golden Bruce Award VII! (#505) Listen to Kalvos rant about music competitions and the age & class discrimination which you can read about in detail or just listen to a show of longer music we love. Or Music We Lerve & Love! in two parts (#504 and #503). Or Music We Hate in two parts (#502 and #501). And there's the incredible Five-Hour New Year Show #500 Special featuring Elizabeth Panzer along with Kalvos and Damian performing live in Studio Z! And before that, It's All About the Organs! Organs Without Shame (#499) features nonpop organ music of most guises by Philip Blackburn, Thomas Massella, James Signorile, Ron Hannah, Gilles Yves Bonneau, Tim Cummings, Alex Shapiro, Gary Verkade, Steve Nelson-Raney, Wendy Mae Chambers and others. Before that, two shows of newly released recordings (#498 and #497) including music by Jocelyn Morlock, Michael Byron, Ronda Rindone, Joan LaBarbara, Jacqueline Humbert, David Rosenboom, Judith Shatin, Elizabeth Hayden Pizer, Jonathan Piezlak, Oleksa Lowochuk, John Burke, Mike Vernusky, Vivian Adelberg Rudow, Gilles Gobeil, René Lussier, Matthew Burtner, Robert Moran, Erik Mälzner, Jeremy Beck, Hot Troche, Paolo Longo, Mark Applebaum, Steve Peters, Bruce Pennycook, Brad Dutz, Larry Gaab, Robson dos Santos, and Matthew Fields. Not enough? How about the Tribute to Frank Zappa (#496) where we play music by composers who have been influenced by Frank Zappa. Hear music of Rhys Chatham, Tom Hamilton, Peter Zummo, Eric Salzman, Jon Appleton, Joseph Benzola, Alex Abele, Marc Gustavson, Samuel Claiborne, Cindy Lubar Bishop, Nick Didkovsky, Tony Lanman, John Luther Adams, Gene Pritsker, and others. Then back into our interview series: John Trubee, who may or may not have changed in 30 years (#495). Margriet Hoenderdos, reserved Dutch composer whose music is precise, intense and committed (#494). Cindy Lubar Bishop and Peter Girard, who explain how their five-year collaboration came to fruition (#493). Damn, the mosquitos are out early this year! We've heard again from the crackerjack boyz at Moses & Singer. They're still demanding we remove music from the site that we already removed. Not that that's a good thing, but you still gotta love an arts licensing organization that is so utterly clueless, buzzing around with misinformation. I'm glad they're not handling my licensing. Phew! Kalvos is guessing that all they looked at were the playlists, but we don't want to give it all away so we won't let them in on our little secret. Pssst! The playlists are what we played, So it's a historical document! The music isn't there! Get it now? Naaaah. Anyway, here's what we posted three weeks ago, and if you're in the mood, pop us an email. We'll publish what you have to say, or read it on the show. We Welcome Alex Shapiro to our Board of Advisors! Having made just too many suggestions to K&D about what exciting things they might do, Alex got snared to be a board member. No, there's not much work -- other than staving off rock-throwing composers -- but, yes, it comes with the terrible onus of K&Ddom. Nice to have Alex on the board! Please Retire the Debt! We offer our heartfelt thanks to all our contributors for 2004 for their generous gifts to K&D. But we finished 2004 in the red by $1,361. Your contribution is strongly encouraged because we could sure use some help here. We know the economy's not so good, but there's any number of ways you can send us a bit of cash. The server, domains, etc. (before a lick of work is done) cost $1,536 per year. We use supplies, put up & feed guests, fix equipment and update software. If every site visitor contributed ten cents upon each day's visit, it would pay the bills. Try the PayPal link, or contact us via email or snail mail. Please. K&D gets 50,000+ hits per day (about 700 unique visitors). Help. Never Heard a Besto? David Gunn a/k/a Damian (or is it Kalvos?) creates a Best of the Bazaar for each block of five shows. No, this isn't just a selection or two that he likes. These Bestos are collages of sound art of the highest order! Eat your heart out electroacoustic composers!. More than seven hours of Bestos can be heard and #82 is the latest of these! Concert with Brian and Wenlil! Brian Sacawa and Wenli Zhou just tumbled the monitors! Listen to music by Lee Hyla, Chris Theofanidis, Martin Bresnick, Philip Glass, Charles Wuorinen and Michael Gordeon played by Brian's amazing saxophone and Wenli's string-bustin piano -- all live from Studio Z! Note: We will rebuild this show from the Studio Z masters at a later point, as there is some distortion in a few selections. We had a heck of a day ... yes, the monitors really did fall down! Next week: Baruch Skeer! Live to K&D comes Baruch, with an array of Jewish-oriented music. February 26! The newest show is an interview and concert with Gregory Mertl! Listen to the composer's music played by Anna Hendrickson, oboe; Courtney Orlando, violin; John Richards, viola; Florent Renard-Payen, cello; Kirsten Sollek, mezzo; Elisabeth Stimpert, clarinet; and Solungga Liu, piano -- all live from Studio Z. Next week: Brian Sacawa and Wenli Zhou! Live in the studio comes the sax-piano duet with high-energy music, intensity, and laughs! Listen to K&D on February 19! The newest show is longer tunes we love, and the Golden Bruce Award VII! Listen to Kalvos rant about music competitions and the age & class discrimination which you can read about in detail or just listen to a show of longer music we love. Next week: Greg Mertl! Live in the studio with an ensemble of wonderful musicians in Gregory Mertl -- hear what he has to say, and listen to his music played by Anna Hendrickson, oboe; Courtney Orlando, violin; John Richards, viola; Florent Renard-Payen, cello; Kirsten Sollek, mezzo; Elisabeth Stimpert, clarinet; and Solungga Liu, piano. That's next week, February 12, live in Studio Z. The newest show is more of that music that's on our minds, Music We Lerve! We just had to do it, so have a listen to a show of more music we love. You must check out our upcoming guests! As soon as we said we were going off the air in September, the schedule crowded right up! So check out the guest list to learn when you'll hear from Greg Mertl live in performance with Anna Hendrickson, oboe; Courtney Orlando, violin; John Richards, viola; Florent Renard-Payen, cello; Kirsten Sollek, mezzo; Elisabeth Stimpert, clarinet; Solungga Liu, piano ... and Brian Sacawa, sax, and Wenli Zhou, piano, live in performance or Baruch Skeer or Wayne Horvitz or Rami Bar-Niv live in performance with Michael Hakim, or Thomas L. Read or Hsiu-Hsiu Chang live in performance or Brian Johnson or Rob Voisey with 60x60 or Allen E. Shawn or Troy Peters or Pamela Z or Barry Schrader or David Kidwell or Judith Shatin or Gene Pritsker and Charles Coleman or Peggy Madden or Linda Catlin Smith or Pamela Zero live in performance! And we have yet to schedule exact dates for The Anti-Social Band, Jody Diamond, James Drew, Matthew Fields, Carson Kievman, sylvi macCormac, William Mayer, David Mooney, James J. Pellerite, Yvette Perez, Larry Polansky, Kile Smith, P. Kellach Waddle and Peter Zummo. Phew! Okay, that was enough hated music. Now we admit we loooooove stuff! The email and calls rolled in, so we repented doing only music we hate, and have done a show of music we love. Now that's the good news. The bad news? We'll do a second one next week! Blame Alex Shapiro. She Made Us Do It! "Binge and Purge -- Music We Hate, Part Deux" is Posted! Yes, Alex liked last week's show so much she suggested an MST2K version, and we fell for it, and ran second Music We Hate show. You'll recognize yet more names ... choosing individual selections by some of the K&D favorite composer list that we can't stand for more than a few seconds. Your heard the first -- now hear the worst! And tell us what you think. The latest playlist is also up, along with the usual site updates and of course Damian's latest essay, Bassoonami, where you're certain not to like what's on the menu. So listen to show #502 -- and join us next week for whatever we can cook up until, as you'll find on the upcoming guest list, we host live performances and interviews with Greg Mertl, Brian Sacawa, Baruch Skeer, Wayne Horvitz, Thomas L. Read, Hsiu-Hsiu Chang, Brian Johnson, Rob Voisey, Troy Peters, Barry Schrader, David Kidwell, Gene Pritsker, Charles Coleman, Peggy Madden, Pamela Zero, and others! The "Music We Hate" Show is Posted! After our interesting experience (see January 5 notice below) with attempts to censor our opinions, we decided that a Music We Hate show was in order. You'll recognize a lot of names ... it sure was fun to pick out the pieces by some of our most wonderful composers that really make us go nuts with boredom, irritation, bristledom, teethgrindingdom, and furydom. Tell us what you think -- after all, we got more phone calls about this show ever while we were on the air. The latest playlist is also up, along with the usual site updates and of course Damian's latest essay, Melophobia, exposing the fear of music and its herringlike consequences. So listen to show #501 -- and join us next week for more of the recordings newly received at K&D!. And while I've got your attention -- be sure to check out the upcoming guest list, which has live performances with Greg Mertl, Brian Sacawa, and others! We Have Fun on K&D. And that's why, when we get cease-and-desist orders from uninformed lawyers representing spiteful composers who, under the guise of the law, aim to steal time & cash & effort from the hundreds of dedicated composers who make this site come alive, right before our 500th show which reminds us that we've been sweating for ten years while they've been sitting on their butts ... well, we get really annoyed, and really, really (really) tired when we have to deal with it with hours of personal time (which is, of course, their nasty little point), and we despair when you have to be victims of it with late shows, unfinished pages, incomplete clips and images, and worst of all, defaced and vandalized program archives that eviscerate their value to research and musicology and history, all brought to you by the kind of people who would have packed smoldering straw around the Library at Alexandria, and we're sick of their small-minded behavior -- which doesn't sound the fun folks we usually are, does it? Nope. But the lot of these nay-sayers are an unmitigated disgrace to the arts. Read all about it, and if you're in the mood, pop us an email. We'll publish what you have to say, or read it on the show. Happy New Years! Five Hours of It! Our Five-Hour New Year Special is Available! The latest show, Five Hundred Improvisations, features Elizabeth Panzer along with Kalvos and Damian performing live in Studio Z! Also, there is music that can't be heard anywhere else, all provided by the composers, for this amazing program! The latest playlist is also up, along with the usual site updates and of course Damian's latest essay, The Day of the Leopard, revealing what the fashion leanings of the world of the felix. So listen to show #500 -- and join us next week for more of the recordings newly received at K&D ... as well as news of K&D's latest gift in the world of cease-and-desist!.